Dental implants are fast becoming the first choice for both dentists and patients alike when it comes to replacing missing teeth, but like with all dental procedures, many patients are concerned that getting them will hurt. 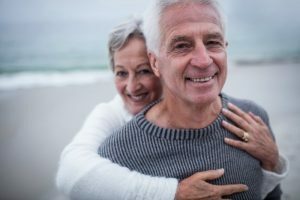 Fortunately, most dental implant patients report that the discomfort associated with the procedure is minimal at most and more than worth the benefit of being able to eat, speak, and smile with confidence once again. With dental implants, you have everything to gain and nothing to fear. A dental implant is actually a small titanium post that is placed directly into the jawbone in order to recreate the root structure of a lost tooth. This can then be attached to a multitude of prosthetics that can replace everything from a single tooth all the way to an entire row. This prosthetic root is what makes implants so special as it helps rebuild an entire tooth rather than just the portion visible above the gums. The process of getting dental implants usually takes a few months and starts with a minor surgery where the implant(s) has to be positioned within the jawbone. It starts with a small incision in the gums, and then the implant post itself is gently screwed into the jawbone. After this, a patient is given 3-6 months to heal, and during this time, the post actually melds with the surrounding jawbone to create an even stronger foundation for the new teeth. At this point, a patient will return to their dentist to have their replacement teeth attached to the implants. While the procedure itself might sound uncomfortable, don’t worry, know that placing an implant is actually much less invasive than simply removing a tooth. Your doctor will use local anesthetic to make sure you’re completely comfortable the entire time. You’ll still be awake during the procedure, but you’ll likely feel next to nothing during it. And, for your peace of mind, know that the bone the implants are being placed into does not have many pain-sensing nerves, meaning the brief drilling will likely be virtually painless. If you’re still a little nervous about the procedure, just let your doctor know, and they’ll be able to offer you a number of helpful sedation options. The discomfort you may experience after the placement surgery will be comparable to any major dental procedure. You might have a bit of swelling, tenderness, or minor bleeding around the surgery site itself, but over-the-counter pain medications like Ibuprofen will be more than enough to handle it. You can also use a cold compress to reduce your swelling, and it’s recommended that you only eat softer foods for the first 10-14 days after your surgery. Rinsing with warm salt water a few times a day can help provide relief as well. Basically, if you’ve had your wisdom teeth taken out, recovering from implant surgery is very similar and often much less uncomfortable. Altogether, dental implants are simply the best way to replace missing teeth available today, and the procedure to get them isn’t anything to fear. Under the care of a qualified and experienced doctor, you’ll barely feel anything at all, and before you know it, you’ll be seeing your complete smile in the mirror again. Dr. Allan S. Mohr is a general, cosmetic, and implant dentist based in Massapequa Park, NY. Over the course of his 30+ year career, he has literally restored thousands of smiles using dental implants, and he’s continually amazed at the results he can achieve with them. He currently practices at Smile Creations, and he can be reached through his website or by phone at (516) 541-7344.
by: allanmohr at September 27, 2017 . Comments Off on Does Getting Dental Implants Hurt?